Mondelez International has today announced it will go ahead with a $7 million plan to redevelop Dunedin's Cadbury World and add 25 jobs. In a statement this morning company also committed to running many of the events part of Dunedin's annual Cadbury Chocolate Carnival. The company said following its decision to end manufacturing operations in Dunedin, which will take effect in March next year, it had worked with tourism experts and community leaders to progress designs to ensure the "landmark site remains a lasting legacy for the Dunedin community". The investment was signalled by Mondelez when it announced the closure of the factory, which will result in the loss of about 350 jobs. New Zealand country head James Kane today confirmed the decision and detailed the significant plans for growth. "The $7 million investment will create an entirely new tourism experience in the historic Castle St Old Dairy which is being refurbished to provide a new home for Cadbury World. "We hope to double the number of full-time equivalent roles from about 25 to 50. "Visitor numbers are expected to go from 110,000 to over 180,000 per year, ensuring it remains one of Dunedin’s most popular tourist attractions and a popular meeting place for the local community. "The decision to end local operations has been a difficult one for our people and the business, however our investment in Cadbury World ensures an important part of Dunedin’s growing tourism sector remains in the city,” Mr Kane said. 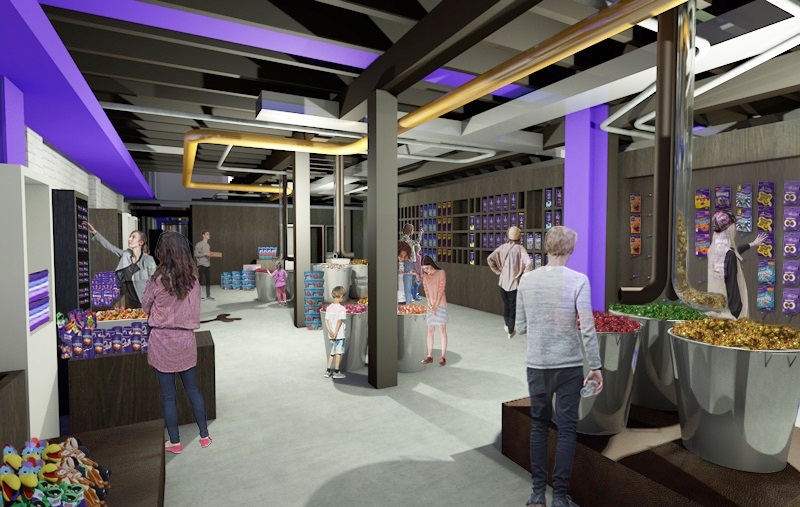 As well as the permanent roles in Cadbury World, the construction phase will employ about seven full-time workers, and up to 30 on-site contractors during the peak fit-out period. About 75% of the project budget will be invested with local suppliers with the project to be completed by late-2018. Dunedin Airport chief executive Richard Roberts said the commitment to Cadbury World ensured Dunedin’s tourism offer remained strong in a competitive domestic and international environment. “The tourism sector in Dunedin is incredibly exciting with about two million domestic and international visitors each year enjoying a range of attractions that provide varied groups with things to do. "Where I think Cadbury World adds so much to the local tourism offer is in the family space where visitors are looking for something fun that will both educate and excite people of all ages,” Mr Roberts said. The redeveloped site would include a magic elevator, sensory chocolate experience, historic displays, and public open space. Mondelez also committed to retaining many of the events part of the Cadbury Chocolate Carnival. "We know many of the Carnival events are incredibly popular, and also provide support for local community groups,” Mr Kane said. "We thought long and hard about what would be appropriate in 2018 following the closure of the Dunedin factory, and sought feedback from the local team and community stakeholders. Mondelez would now work with stakeholders, including community partners, to identify the events from the Cadbury Chocolate Carnival that could feature as part of the calendar of events. Fantastic news that Cadbury's will continue to advertise their chocolate products in the empty shell where they used to make chocolate products. A ringing endorsement that Dunedin still has it uses. In this case a large billboard for Cadbury chocolate. I find it very hard not to share in Snozzman's outlook given what Mondelez has done to all the workers at Cadburys. However if it does provide some long term tourist benefit to the city (as Legoland does in areas where they don't manufacture Lego) then I guess that is a good thing. Having said that I would be surprised if it does hold the same allure given there isn't a working factory attached.